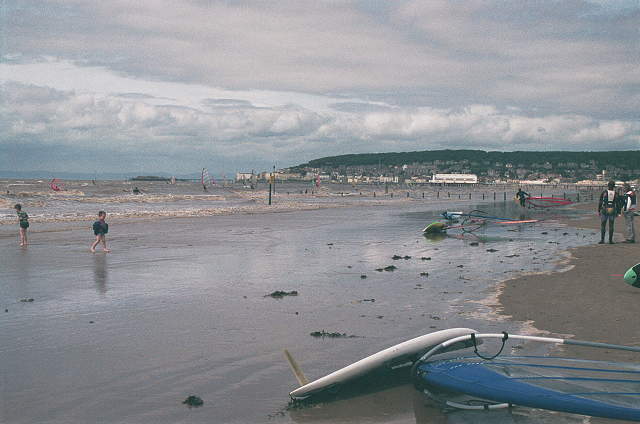 Weston - sometimes referred to as Weston-Super-Mud - lies about 20 miles SW of Bristol, on the Bristol Channel. Beach is a very large expanse of sand which accomodates a variety of sports including land sailing, sand castles, kite buggies, fishermen, windsurfing and on the summer evening - joy riding. 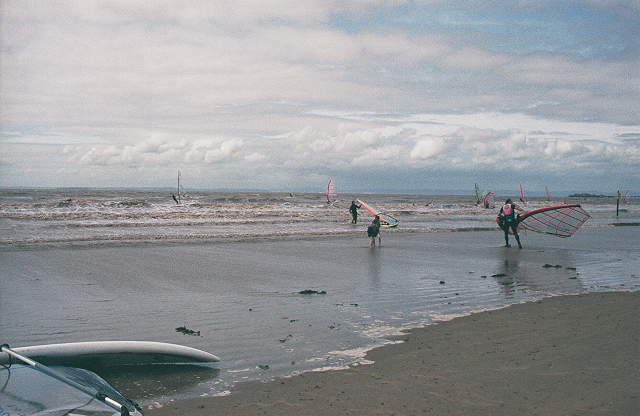 Over recent years (2007), the council have decided to stop people enjoying themselves with windy pursuits, and have banned kite buggies, land speedsailing and other beach-bound activities. I believe the coralled-off area between Weston & Uphill is the approved location for such activities, but you're not allowed to use it unless pre-arranged and all participants have several millions pounds-worth of 3rd party insurance. Consequently, I've never seen it used. From the ends of the lines of wooden posts (which are used to zone the beach), the sand turns progressively to soft mud. The further out you go, the higher the mud to sand ratio becomes - consequently I don't recommend you sail too long before or after high tide. Depending upon some whole bunch of variables that I don't understand, this muddy zone can some years be sandy. As you head further towards the S end of the beach (The Uphill end), once off the firmer sand that runs down to the bottom of the lines of posts, the sea bed becomes progressively muddier, slimier & blacker. The waves also seem to be better down this end - better shaped & better spaced apart. There are also some big waves that form a way offshore towards the end of the pier. Positive: It's in the Bristol Channel so the prevailing SW wind funnels up the channel, picking up strength (at least, that's the theory!). Negative: It's the Bristol Channel, which resembles chocolate soup when the tide's in, and - quite literally - miles of mud flats when the tide's out! The tidal range here is the second largest in the world, peaking at around 14.5m on the "springiest" of spring tides. On a good day, Weston can be an excellent place to sail. On a bad day it is an achievement to get off the beach. The afternoon sea breezes at Weston during the summer can be fantastic and often blow 5-6m weather till 8 in the evening. Weston gets very busy in the summer & on bank hols. Sometimes just getting down the M5 to WSM from Bristol can take ages. This stretch of the M5 often resembles a parking lot in the summer. The beach parking can fill up pretty quickly too, despite the size of the beach. Why on earth anyone would want to come to WSM for a holiday or "family pleasure trip" is completely beyond my powers of reasoning. From the M5, jn 21, head towards Sea Front & Tropicana. Drive S down Beach Rd to the bottom of the promenade, then turn R into Marine Drive about 1/4 mile S of the Tropicana & then onto the beach. Parking is on the beach - free in Winter, around £5/car in Summer. The council aren't all bad: From 2007, Windurfers get a special concessionary rate for parking on the beach. Just £1 will get you on all day. Most people sail from near the main entrance to the beach. You used to be able to drive the length of the beach down to Uphill, but the Council decided to stop this. Uphill can be better in more Southerly wind as the wind funnels between the land & Brean Down. To get to Uphill, carry on past Marine Drive for about 1 1/2 miles, then go through Uphill village to the beach. You have to pay here, too! Prevailing W wind is practically dead onshore. S & SW can be gusty (may be better at Berrow). Anything with E in it is offshore, gusty & almost certainly flat water. NW to N is probably the best direction. Northerly is cross shore, starboard tack. Waves tend to be mushy, close together, and come at you from all angles - not well-behaved at all. Together with the almost onshore wind, it can be real struggle to get out back. If you can sail Weston well, you're probably ready to take on almost anywhere else. There are a real core of people who sail Weston: On a good day, there'll be 40-50 people out & it's not overcrowded. HW springs tend to occur between 07:30 & 08:30. HW neaps between 12:00 & 15:30. As mentioned before, tidal range is HUGE. Max ~14.5m. Smallest neaps are around 7.5m! The sea comes up to the ends of the posts when the tide is at ~8m. Tides over 12.0m mean not very much beach left, which, in turn, means there's little parking area available, and hazards - in the form of submerged posts - increase. Realistically, you can sail 1 1/2 - 2 1/2 hours either side of high tide: nearer 1 1/2 hours on springs & 2 1/2 hours on neaps. Midday high tides are neaps. At the Weston end of the beach, near the entrance, and using the line of wooden posts as a guide - then anywhere up the beach above the end post is sandy. Going out from the end of the wooden posts, there a 20-30m band of soft mud - becoming increasingly firm now (Sept '04) as it's getting covered over with sand. Further South - towards the Uphill end of the beach, it's really very muddy below the sandy beach. As a guide, a really small neap tide of 7.8m will not come in any closer than 150m from the end of the wooden posts. And then, you'll wade through another 60-70m of ankle-deep water before it's sailable. It's a very flat beach, thus there's no real shorebreak & the water literally disappears out of sight at low tide. This flatness also makes it particularly suitable for land speedsailing, kite buggies, et al. If fact, it can become a bit scary with all the kite buggies at times & the council are taking steps (2003) to restrict and/or zone these activities. Waves tend to be biggest & meanest around HW. Keep clear of Brean Down - it causes a HUGE wind shadow & eddies, plus the River Axe empties alongside & will sweep you out on an ebbing tide. There's no reason for you to sail so far down. Parking on the beach in a 12m+ high tide. Currents are fairly minimal - there's often a slight side shore drift which I've never managed to work out. It seems not to obey the tides! 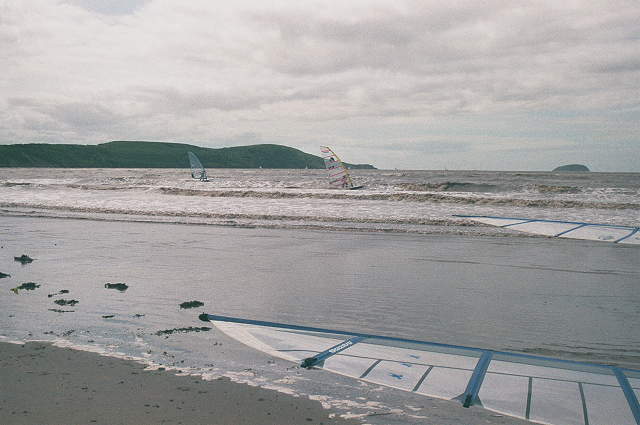 Don't sail in tides over 12m - there'll be no beach left. Don't persist in sailing more than 2 hours after spring HW (possibly 2 1/2 hrs on neaps) - you'll have to slog a long way to get back. At high tide - depending on the hight of the tide - some if not all of the wooden posts will be submerged. Your fin makes a horrible sound when it hits them. You make an even worse sound when you hit them. Regarding the wooden posts near the main beach entrance: about 5m to the S of the line of posts, down the beach from them, is the old, disused sewage outlet from the former hospital. This used to be covered with mud. It's presently (early 2004) well exposed, as are the broken stones & assortment of concrete pieces that used to support/anchor it. When the tides is at about 8.5m, the outlet is covered over with sea, but it can still take your fin off. Don't try to drive your car round the bottom of the lines of posts: Weston beach claims the cars of a couple of bright sparks every year. They get bogged down in the mud - the first high tide usually just leaves the top half of the battered remains showing. After the following high tide, the car's usually disappeared completely. It can be good fun using them as temporary gybe marks! Similarly, beware of parking too far down the beach on an incoming tide - With a strong W wind, the tide comes higher than the predicted height, and continues to come in after the predicted HW time. With just 3-4 inches of water under the car, the wheels will bog down enough to make getting out very, very difficult. T4 on the beach - seemingly now annual music event in July where the whole beach is taken over for the day, thus preventing access for other beach users. Annual motocross event - the beach gets seriously destroyed by big bulldozers in the week running up to the motor cross, and the beach is completely out-of bounds to windsurfers and other beach users for the full weekend of the racing. Usually early October. Parking on the beach - around £5/day in summer (a bit steep if you've only out for a couple of hour's sailing, though it's cheaper after 15:00). Toilets just by entrance to the beach. The toilet block half way down the beach towards Uphill is closed out of season. Ice cream/snack shop during the summer. During the summer you can even catch a donkey ride while waiting for the tide to come in! No campsite or B&B information has been supplied yet - its too close to home for the Nomads, please send us some suggestions and ratings etc if you know of any. Haven't yet tried many pubs, please feel free to suggest a few. The Major from Glengarry up by the Knightstone pier is ok. There are numerous fish and chip shops in and around Weston. I have yet to find the killer one. Let me know if you think you have. Suggestion received anonymously (Aug '03):Try Papa's on Waterloo Street, almost always "just cooked" but not too much hanging around.